Fig. 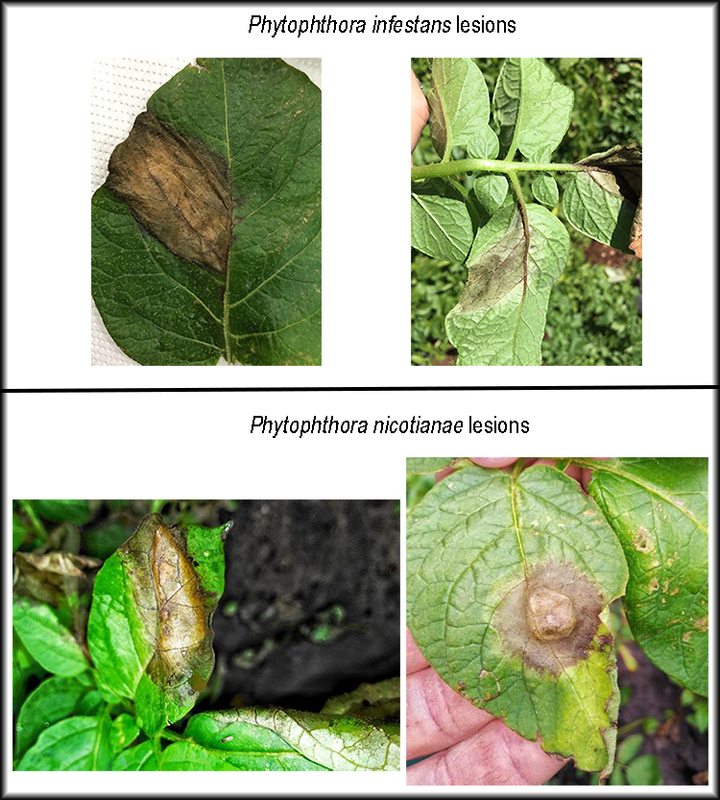 1 Comparison of foliar lesions of Phytophthora infestans and Phytophthora nicotianae. Note the whitish halo on the rightmost image of P. infestans. Due to the recent run of warm, wet weather, conditions are ideal for the development of late blight (Phytophthora infestans) on potato and tomato crops. Over the past two weeks we have received samples exhibiting late blight-like symptoms on tomato and potato. However, further evaluation of these samples has shown that these infections on both tomato and potato were caused by a related species, Phytophthora nicotianae. While normally a soil-borne pathogen, the presence of foliar lesions indicates that the pathogen is also spreading aerially. In eastern NC severe foliar infections have been observed. The severe wet weather and high temperatures are highly favorable for the pathogen, unlike P, infestans, that is most severe under cool weather conditions. P. nicotianae has been detected on both potato and tomato crops. P. nicotianae differs from P. infestans in several ways. While both pathogens can infect foliage and tubers, P. nicotianae is primarily a soilborne pathogen and can infect plant roots. It also has a broader host range than P. infestans and the ability to generate overwintering survival spores including oospores and chlamydospores in soil (Table 1). Foliar infections of P. nicotianae resemble symptoms associated with late blight, including large, water-soaked lesions on leaves and stems (Fig 1). This year, foliar blight has been severe on potato and tuber rot has also occurred. However, P. nicotianae lesions generally do not exhibit sporulation. Due to the tendency of P. infestans to sporulate heavily, lesions caused by P. infestans may show a whitish halo on the underside of the leaf where spores can be observed under a hand lens, but this is not present in all infections. Potato and tomato crops with late blight-like lesions should be carefully checked due to the presence of P. nicotianae in the state. Samples may be submitted to your local extension agent or crop consultant for further analysis or the Plant Disease and Insect Clinic at NC State. P. nicotianae does not spread as rapidly as P. infestans across fields due to lower production of sporangia, but adopting a late blight spray program following label recommendations will help manage the pathogen. Consult the control recommendations on the late blight fact sheet or the 2018 Southeastern US Vegetable Crop Handbook for more information on recommended compounds and spray schedules. It is highly encouraged that samples that are suspected to be late blight are submitted for genotyping by following instructions on the USABlight website. The disease alert and surveillance system also includes additional information on control methods and a decision support tool for fungicide spraying. You can also register to receive email/text alerts when new late blight is reported near you. This article was written by Amanda Saville and Dr. Jean Ristaino and edited by Inga Meadows.